Buff your muscular appearance with a smooth sleek and sheen look that will blow your competition way. 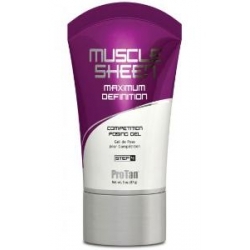 Muscle sheen is used by world class bodybuilders and fitness enthusiasts around the world. Muscle Sheen contains only the finest ingredients available . This professional product highlights and enhances your muscularity vascularity and total hardness. Petrolatum Lanolin Fragrance Tocopherol Acetate (Vitamin E). Place a small amount in your palm then massage a thin layer over entire body. Be careful as to not get any on your costume or posing suit. Contest Tip - Judges prefer Muscle Sheen for pre-judge due to it''s satin shee t.